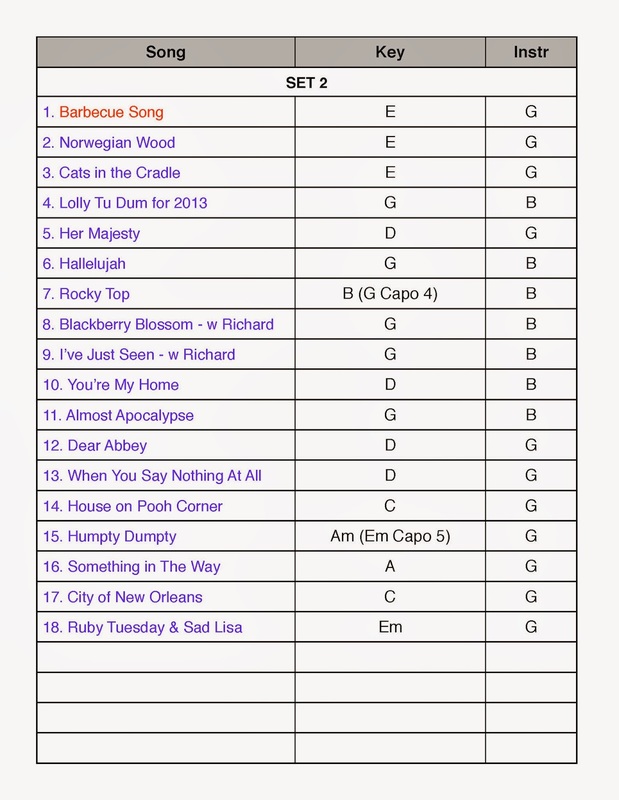 Okay … so I showed you the song list. I spent quite a bit of time going over and over the songs on the list. When words were forgotten I looked them up on-line, why not. 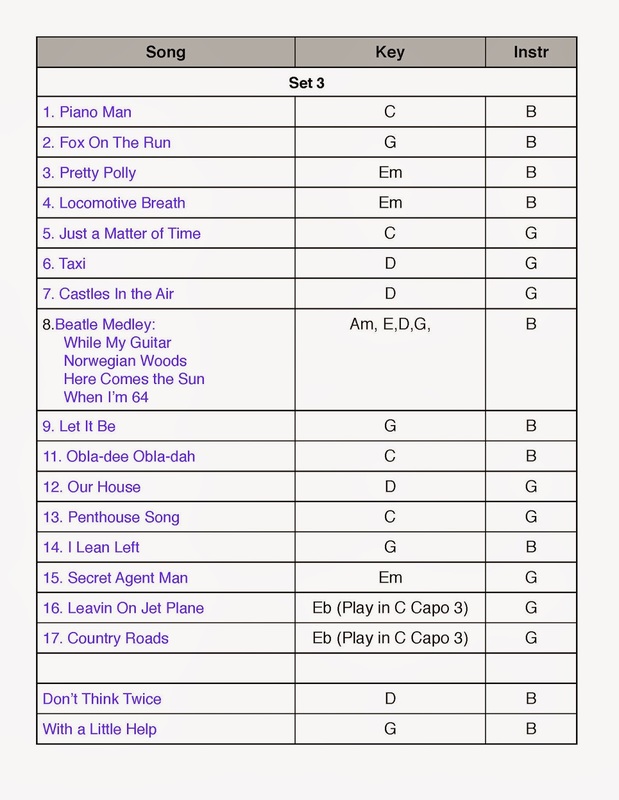 And several times I re-checked the chords … on-line … because I could. Then came the difficult task of deciding to capo or not to capo … very important to be comfortable singing a song in a particular key. The entire song … sometimes the verse is no problem but the chorus jumps out of range and visa versa. Once I had a good idea of the instrument I'd be playing, and the keys for each song … I made sure that I added it to my "pages" spread sheet. If you do it once then it's easy to find, copy and paste. Then … I had to make sets … not an easy task when you are shooting for approximately 3 sets - 45 minutes long or longer. 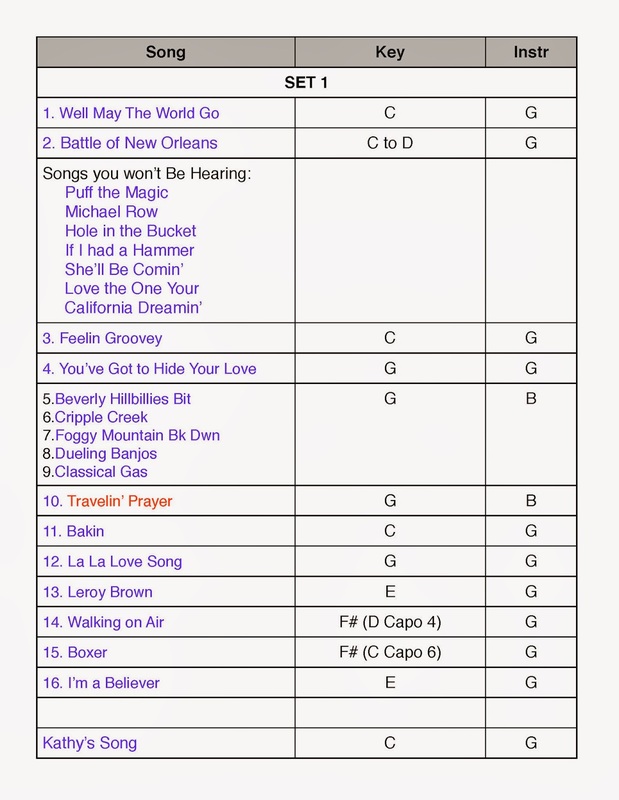 And each set has to have a good beginning … strong middle grouping of tunes … and a powerful closer or two. Now, in my case I also wanted there to be an instrument mix-up, meaning a few guitar tunes, some banjo, back to guitar … and a variety of KEYS so everything didn't sound the same. … and most of all I wanted folks to feel comfortable with familiar and/or semi-familiar tunes, so they would want to join in. And the, you will notice the two songs in RED, they were the one's I needed to peek at the words … printed out in very large type in a notebook that was at my feet. I knew all the other songs by heart and really wanted to do the one's in RED, so I looked. NEXT: Part 4: Practice the set list and make changes if needed, and think about the "banter"